I am new to the forum and I actually joined wanting to find out what shrub I had discovered behind my garage but I did find out what it was eventually asking around. Anyway the poor thing has had a rough life since I moved in. I moved to my place May 2005 and I thought it was just a nuisance shrub and lopped the whole thing down, being I moved in after it bloomed and greened up I didnt know it was a "good" shrub. Last year it probably wasnt big enough to show out very much plus we had a late hard freeze but this year, it is actually has grown back several inches, 17" of rain during for the month of March probably had something to do with it. 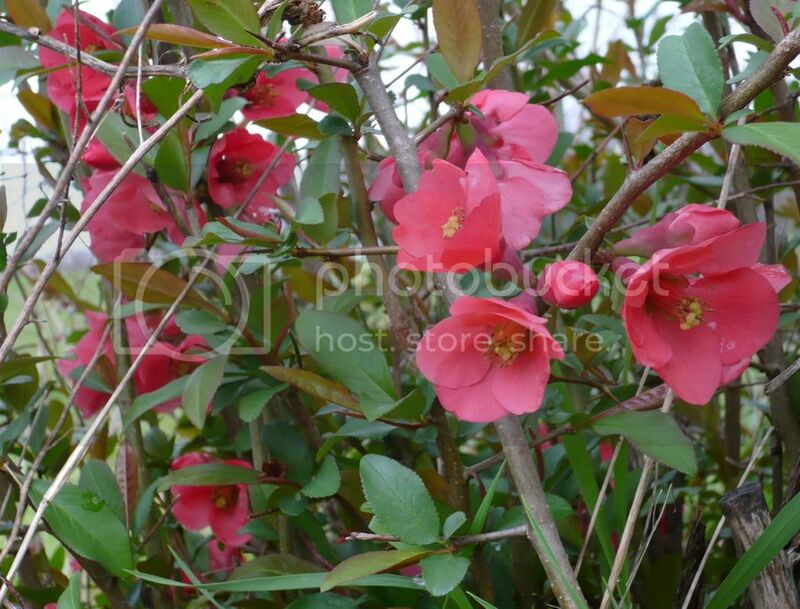 But I noticed it blooming today and started wondering what it was and I found out it is a Flowering Quince. I have some questions about them, now that I am in touch with my green thumb. Does it need pruned? If so, how? It is obviously hardy since it is coming back after being wiped out. What do I need to know about it, good and bad? Is it invasive? Going to try and attach a photo of it, not real good at these forum html things so you may just see a bunch of hoobla. As far as I can tell it doesn't make too much difference how you approach Chaenomeles. They seem to be almost unkillable and apparently thrive on abuse and neglect. They do spread but in my experience at a fairly measured pace. My biggest complaint is that aside from their brief bloom season they are fairly boring plant and take up too much space relative to their aesthetic returns. The twiggy growth also traps leaves, stray pieces of paper, plastic bags or anything else the wind or people bring in and it is difficult to clean them out. My experience with "Quince"... went over a Span of 40 years. The Quince I planted, I thought was a "flowering" Quince... It was beautiful every Spring.. it grew to about 25 feet ... It was not a flowering Quince ...It bore Edible Fruit. That looked like this. Last edited by Dom Nizza on Mon Apr 14, 2008 11:33 am, edited 1 time in total. Sean117Ply & Dom Nizza, I think what you have/had is Pseudocydonia sinensis, the Chinese Quince. I don't recall ever having seen one myself. It is also apparently possible to make preserves & jellies from the fruit of Chaenolmeles spp., the Flowering quince but again I can't claim to have had the experience. MaineDesigner wrote: Sean117Ply & Dom Nizza, I think what you have/had is Pseudocydonia sinensis, the Chinese Quince. I don't recall ever having seen one myself. Lots of recipes and information available ... check this one out. All this walking around in the garden and talking about "food" I thought I'd offer you a cup of "hot cider" on the house. I might have to start a "new thread on food and stuff. What do you think? Is it OK to add a little Rum? My poor butterfly bush. :( Help! My poor old spruce shrubs!